So this is not the first time I've reviewed the KWC/Cybergun Series of full metal, full blowback CO2 4.5mm Steel BB pistols. The most popular version being the Cybergun Tanfoglio Witness 1911 since it was the first one on the scene. 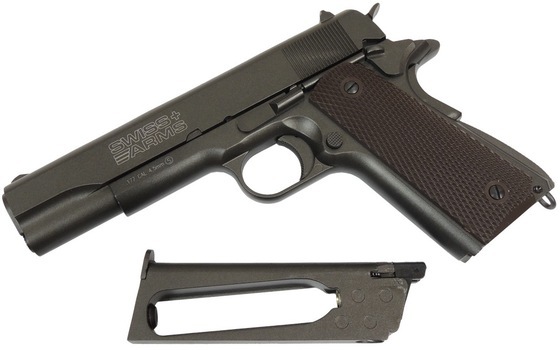 These BB shooting 1911 replicas come in several styles and can be found in both 4.5mm Steel BB and 6mm Airsoft versions. They are made by KWC but can also be found redistributed by Cybergun with either the Tanfoglio Witness or Swiss Arms licensing on them. Today I revisit my Field Test Review since it has been a long time and the way I conduct my field tests has changed a bit so I wanted to test this popular 1911 CO2 Replica using multiple cameras and a more scientific testing approach. 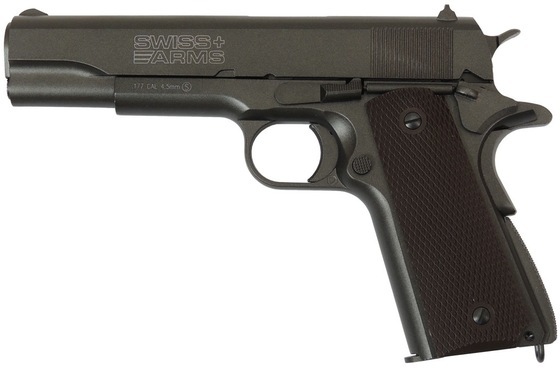 In a nutshell, the KWC/Cybergun Swiss Arms P1911 with it's true 1911 single action trigger and full blowback shoots much like its real steel counterpart with less kick of course. It is capable of nice 1.5 inch groups from a 20 foot semi rested shooting position and shoots right around 300 fps which will put a steel BB right through both sides of a water filled pop can. 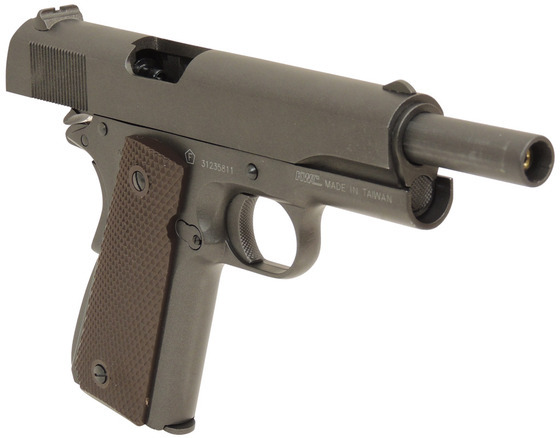 You really can't find a more fun and realistic BB pistol out there, probably why this air pistol has been such a favorite with replica airgun fans.